Called Carpe Diem, the table clock houses an Agenhor AgenGraphe® movement — and is a unique piece for Only Watch 2017. At 2:30 pm Geneva time tomorrow, the 2017 Only Watch auction takes place. This seventh edition of the charity auction to benefit muscular dystrophy witnesses 49 one-of-a-kind timepieces going up for sale. You can see all of the timepieces going up for sale via our two previous slide shows here and here. While all of the timepieces made for the Only Watch auction are one of kinds, several stand out above all others for a variety of unique reasons. One such piece is the clock created by Agenhor. Movement makers extraordinaire — headed up by master watchmaker Jean-Marc Wiederrecht — Agenhor is a company that does not make watches, but has made an important exception for Only Watch, working in conjunction with students from the Geneva University of Art and Design (Haute École d’Art et de Design Genève}, HEAD. Called Carpe Diem, the table clock houses an Agenhor AgenGraphe® movement — a contemporary automatic chronograph that uses central display for all of its indications, including chronograph. Thanks to a 488-part movement, the Agenhor and HEAD designed Carpe Deim Clock features five rotating discs that display the chronograph’s time, with the hours read off through the sphere’s transparent section – the remainder concealed by the sand-blasted outer finish. By using concentric disks housed in a transparent sphere, the movement is revealed in all its beauty. The development of the clock was relatively quick, thanks to the determination of the students at HEAD. Two students developed a sphere to magnify the caliber — concealing nothing from view. Essentially, the movement – that was first unveiled last February – consists of 488 parts and was developed entirely in house by Agenhor and is the brand’s first chronograph caliber. 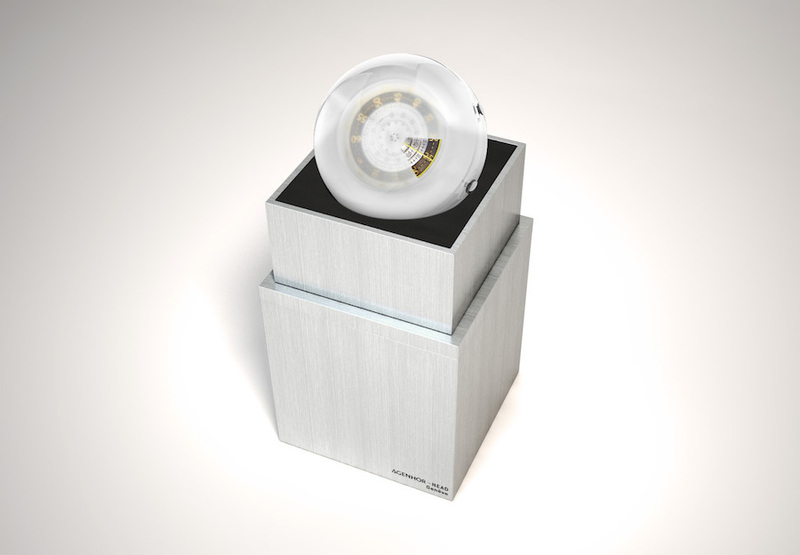 It is the caliber that is highlighted inside the three-part sphere made of Plexiglas. In the center of the frosted glass, is an aperture through which there is clear visibility magnified so that the portion of the AgenGraphe® showing appears just about 1.6 times larger than its actual size. Five rotating disks display the chronograph information and two windows at the top and bottom of the case allow for the hours and minutes to be read. 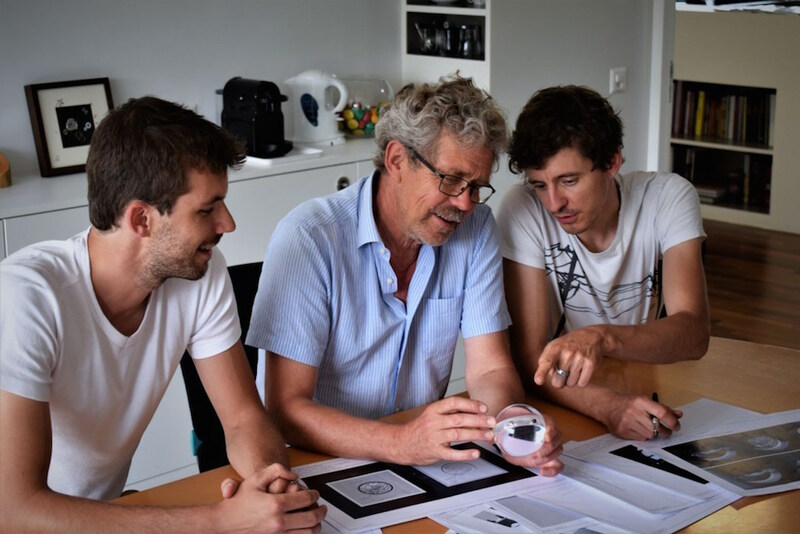 Jean-Marc Wiederrecht’s concept behind Carpe Diem clock is art and the appreciation of time and life. The clock, created with HEAD design students, is being auctioned at Only Watch 2017. The concept is to make the most of the present moment – fleeting yet real – something we all seem to miss in life as we are busy “getting things done,” or “making plans” to do so. The words “Carpe Diem” – “Agenhor – HEAD Genève”, “Only Watch 2017” and “Pièce Unique” (‘unique piece’) are engraved on the barrel bridge. The same engravings can be found on the edge of the hour ring, rotating with the passing hours and visible through the transparent section of the sphere. Elongated rods, specially designed for the piece, allow the chronograph’s Start/Stop and Reset pushers, as well as the crown for winding and setting the movement, to be located outside the sphere itself. 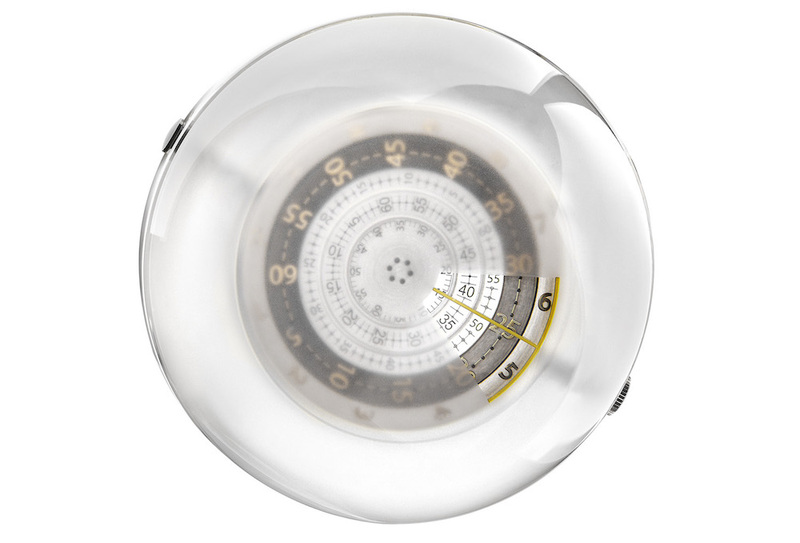 Agenhor’s Carpe Diem is a perfect sphere con- sisting of three parts, all made of Plexiglas: top and bottom hemispheres and, in the centre, a disc. A protective brushed aluminium case has also been specially designed for Carpe Diem. Two windows located in the top and bottom parts of the case allow the hour markers to be read off on one side and the movement to be observed from the other, with- out having to open it. Once open, the base of the case and the sphere, resting on the lining, show it off it in all its glory, sitting atop the upper section of the case to create a display for all to see – and allow the chronograph functions to be used to the full. Other brands participating in this year’s Only Watch auction include Armin Strom, Arnold & Son, Audemars Piguet, Barbier Mueller, Bell & Ross, Blancpain, Boucheron, Bovet Fleurier, Breguet, Carl F. Bucherer, Chanel, Chopard, Christophe Claret, Chronoswiss, DeBethune, DeWitt, F.P. Journe, Faberge, Frederique Constant, Girard Perregaux, H. Moser & Cie, Harry Winston, Hautlence, Hermes, Hublot, Jacob & Co., Konstantin Chaykin, Laurent Ferrier x Urwerk, Jaquet Droz, Louis Moinet, Louis Vuitton, Maurice Lacroix, MB&F, MCT, Montblan, Moritz Grossmann, Patek Phlippe, Piaget, Rebellion, Ressence, Speake Marin, TAG Heuer, Tudor, Ulysse Nardin, Kari Voutilainen, Zenith. The auction event is organized by the Monaco Association against Duchenne Muscular Dystrophy and held at Christies Auction house. All proceeds are donated to the Monaco Association against Duchenne Muscular Dystrophy to support ongoing medical research towards a cure.